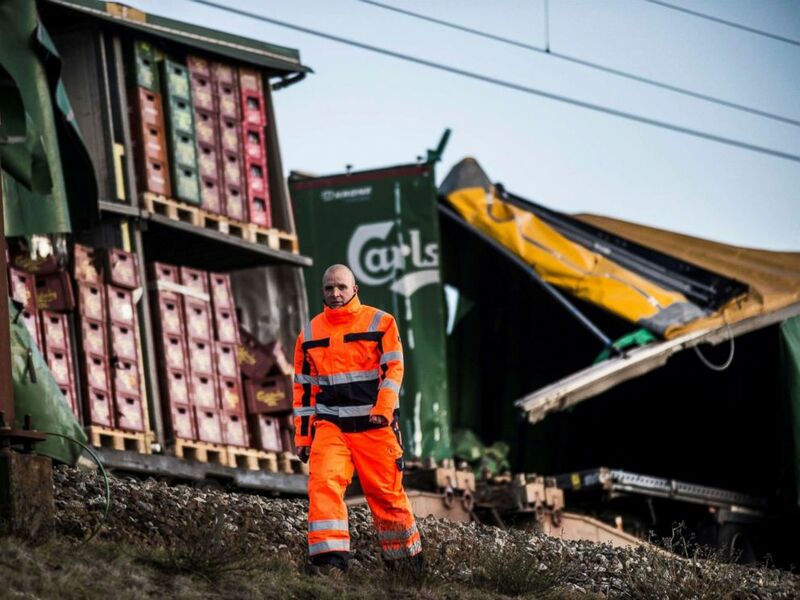 Six people have died and 16 more were injured in Denmark after debris detached from a cargo train and hit a passenger express train on the Great Belt Bridge, authorities said Wednesday. Add Denmark as an interest to stay up to date on the latest Denmark news, video, and analysis from ABC News. The trains were on parallel tracks but traveling in opposite directions, Deutsche Bahn, the cargo train operator, told ABC News. The accident took place around 7:35 a.m. local time. The area was experiencing high winds and powerful waves caused by Storm Alfrida. There were 131 passengers and three crew members on board the train. 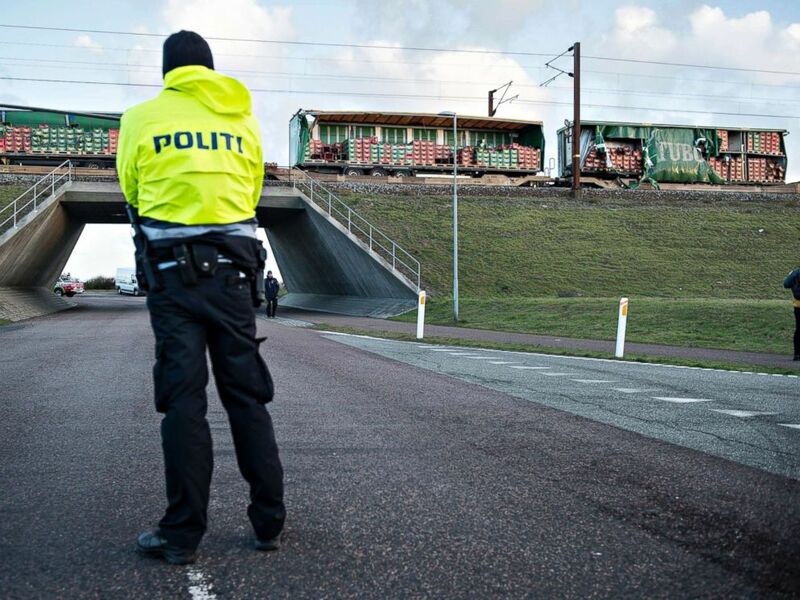 A police officer looks on near a damaged cargo train compartment near the Storebaelt bridge, near Nyborg in Denmark, Jan. 2, 2019. The Denmark Accident Investigation unit and Funen police have launched a joint investigation into the accident. The express commuter train departed from Aarhus at 5:19 a.m. local time and was headed for Copenhagen. A view of a train accident site on the Great Belt Bridge in Denmark, Jan. 2, 2019. Jan Wildau, a spokesman for Deutsche Bahn Cargo Scandinavia, told ABC News that it would be fully cooperating with the investigation. 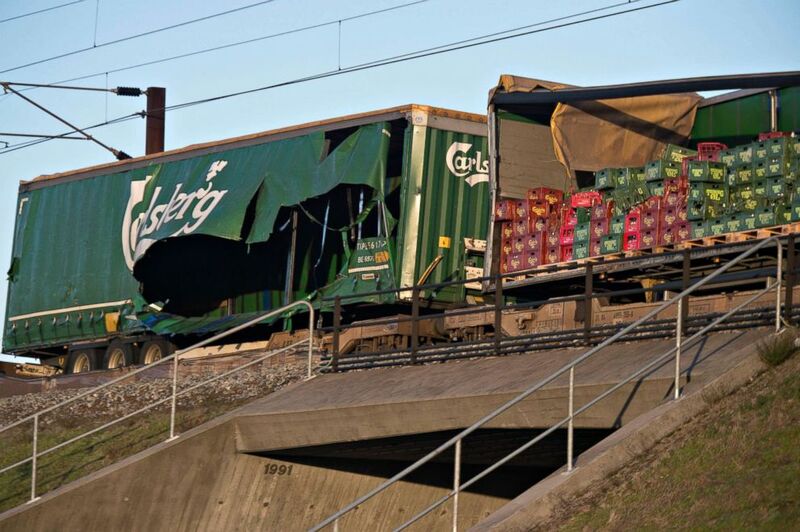 The cargo train had been traveling to the Carlsberg Brewery in Frederecia, he said. The train had received the green light to cross the bridge from Banedanmark, the company in charge of train traffic control, he added. Danish Prime Minister Lars Løkke Rasmussen said his thoughts were with the victims and their families and he thanked the authorities for their response to the accident. Damaged compartments of a cargo train near the Storebaelt bridge, near Nyborg in Denmark, Jan. 2, 2019. The prime minister of neighboring Sweden also expressed his condolences for the victims.